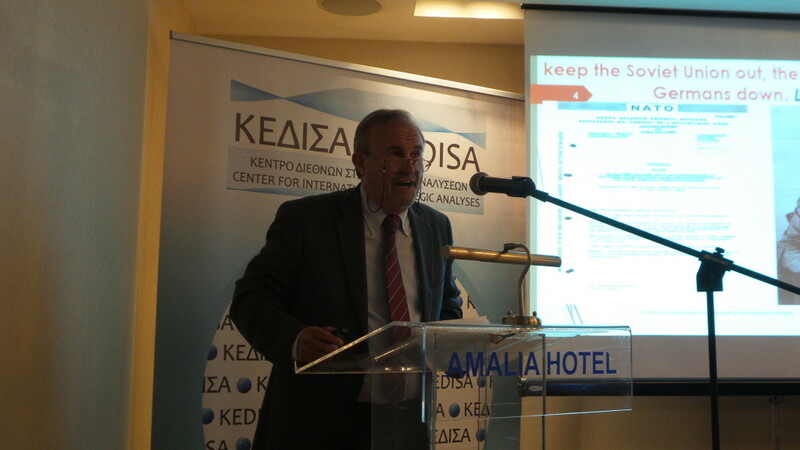 Speakers of the event were the Lieutenant Generals ret. 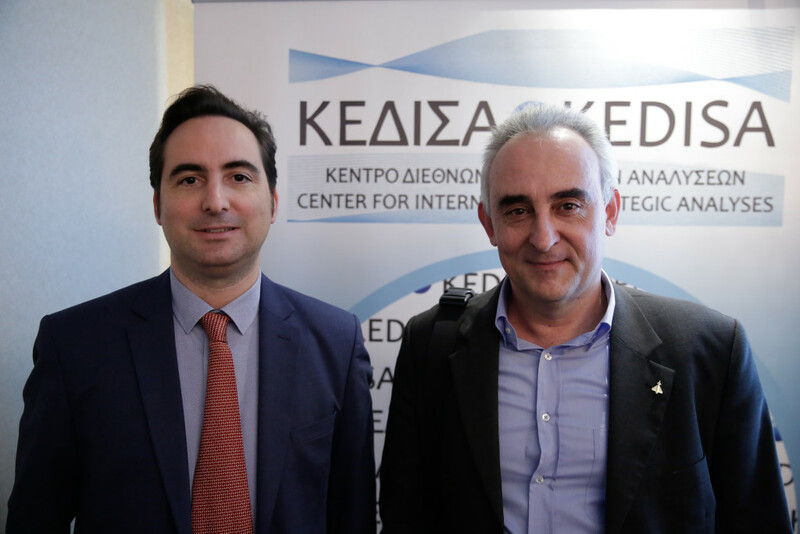 Mr.Konstantinos Loukopoulos, Mr.Ioannis Baltzois and Mr. Lambros Tzoumis as well as the Professor of Geopolitics at the Hellenic Military Academy, Dr. Konstantinos Grivas. Coordinator of the event was the ex advisor to Ministry of Foreign Affairs and the Ministry of Defense Mr. Demetris Iatrides. 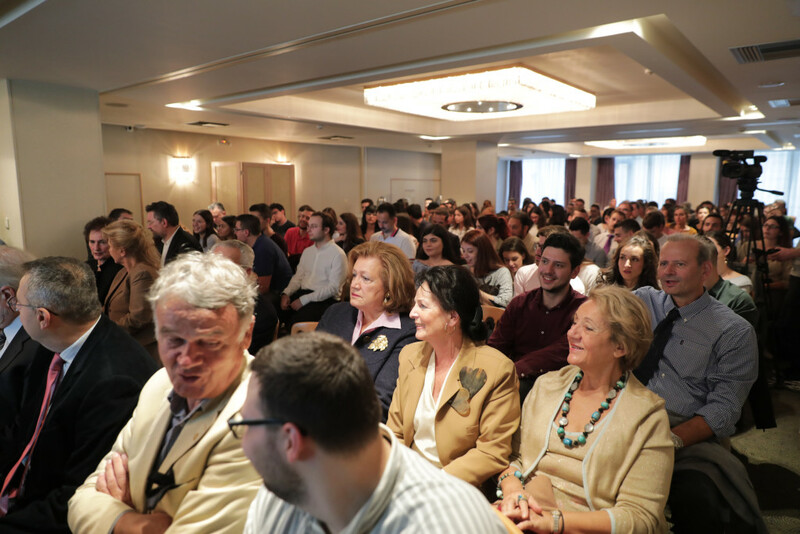 The event was attended by a crowd of people including politicians, generals and admirals, ambassadors, representatives of the Diplomatic Corps, Armed Forces and Security Corps, journalists and numerous students of International Relations of Greek Universities. 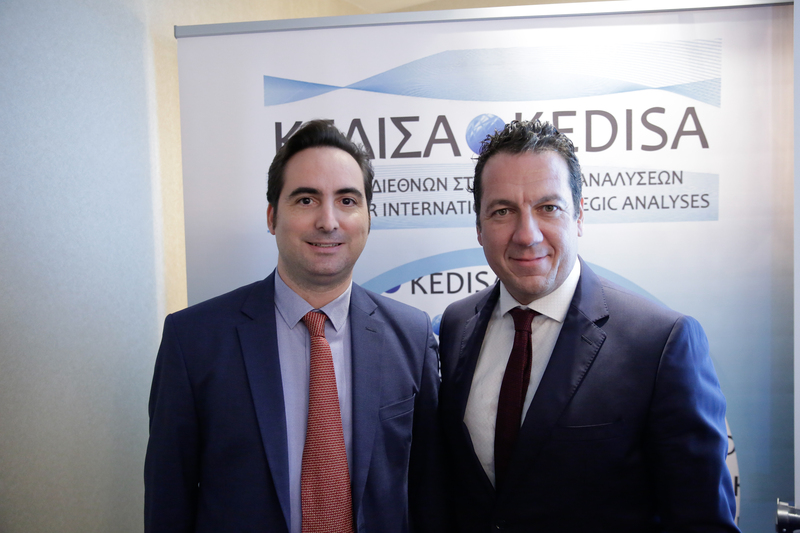 A special honor for KEDISA was the presence of Brigadier Mr. Konstantinos Tsiridis, representative of the Chief of the Hellenic Army General Staff, Mr. Alkiviades Stefanis as well as the presence of the President of the Republican Party (USA) in Greece, Mrs. Aikaterini Papathanasiou. 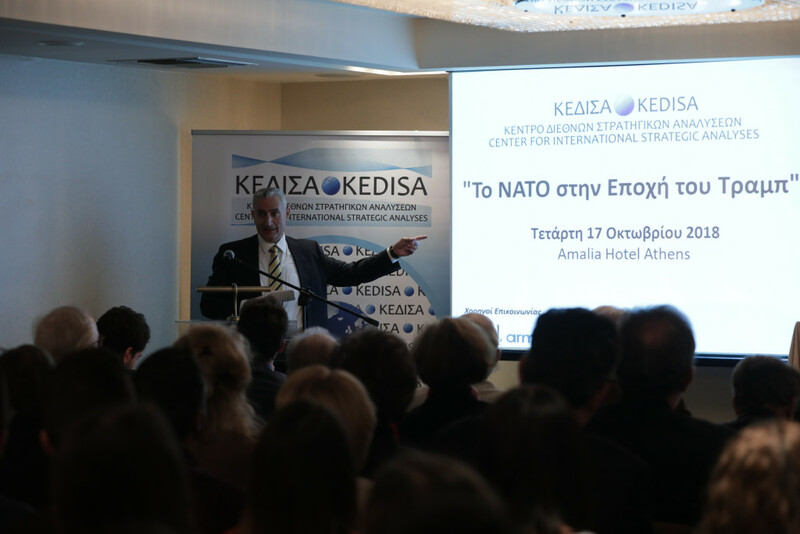 The Founder & President of the BoD of KEDISA Mr. Andreas G. Banoutsos in his introductory speech made a brief historical account of the course of NATO since its establishment in 1949 until today. 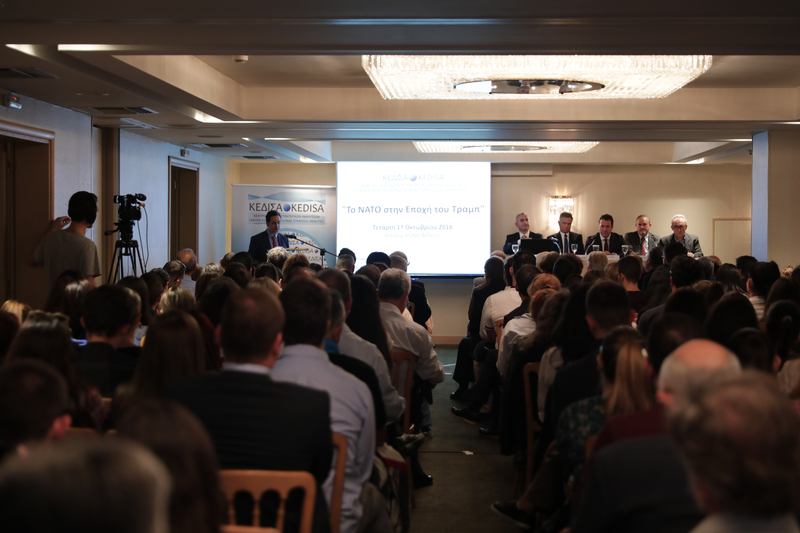 At the same time, he speculated on the feasibility of increasing the Alliance’s military spending to 2% of the GDP of member states at a time when spending on social policy in European states is falling dramatically. He also wondered whether the continued enlargement of NATO undermined the coherence and decision-making within the Alliance. He voiced his concern about whether NATO enlargement in the Balkan region serves Greek national interests in the sense that it might weaken Greece’s negotiating position within the Alliance, since Greece was the only Balkan country member of NATO from 1952 to 2004, and now members of the Alliance are five other Balkan states (Bulgaria, Romania, Croatia, Albania and Montenegro), and the state of Skopje is at the forefront of the accession. Finally, he wondered who would pay the increased cost of investment in NATO infrastructure in the accession countries, given that President Trump does not seem willing that the USA should pay this cost. 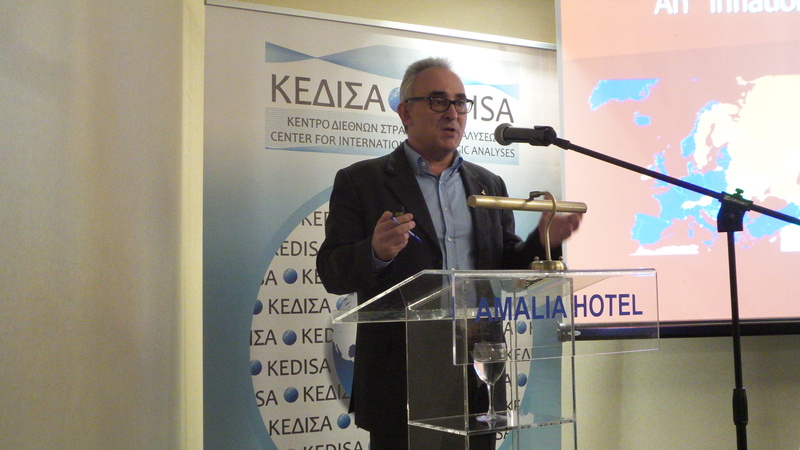 The Coordinator of the event, Dimitris Iatrides, in his intervention filed his reflection on the costs Greece is required to pay for the implementation of the Prespes Agreement in order to facilitate FYROM’s accession to NATO. 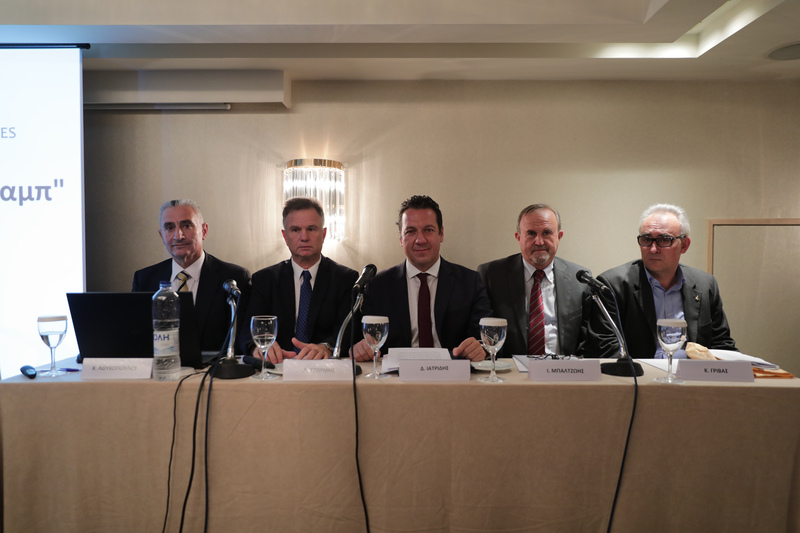 At the same time, he also referred to the issue of increasing military spending to the level of 2% of the Alliance’s member states’ GDP. 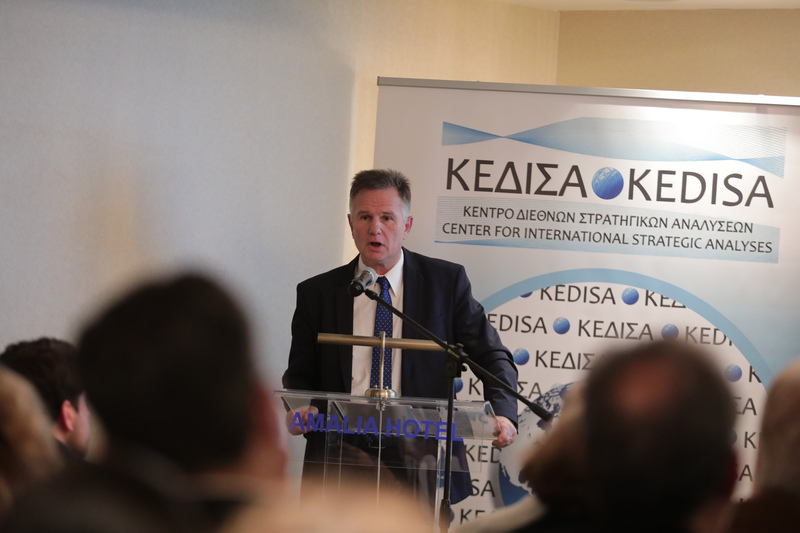 He also referred to NATO’s relations with Russia, China and the EU and pointed out that Greece has benefited from its participation in the Atlantic Alliance all these decades although Greece’s in NATO, has not prevented Turkish invasion and occupation of Northern Cyprus in 1974, as well as the daily violations of the national airspace by Turkey, with a lasting challenge the detention of Greek military officers in a Turkish prison. The Lieutenant General ret. 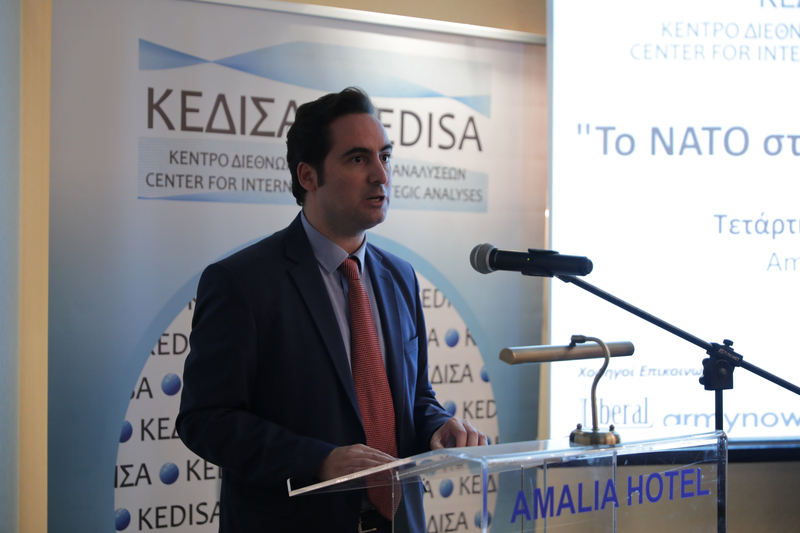 Mr. Konstantinos Loukopoulos said in his speech that NATO is an intergovernmental organization and decisions are made by consensus and that theoretically even small countries have a say in spite of the undisputed leadership of the United States. 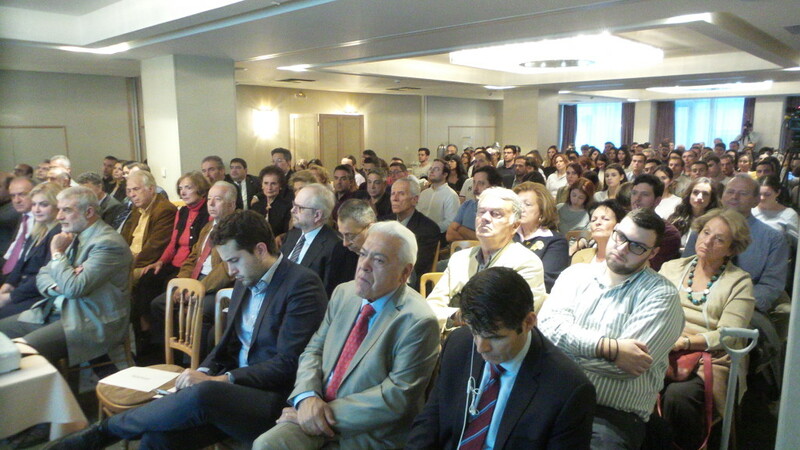 He also noted that the Era is set by the geopolitical challenges and not by the President of the United States alone. He also said that the increase in military spending to 2% of the Alliance’s member states that became the flagship of President Trump’s policy was decided at the NATO Summit in Wales in September 2014 under President Obama. He also said President Trump’s reference to military spending of 4% of GDP as requested by him is not realistic for the other member states and concerns the US itself as a world power. Finally, he said that the Alliance’s challenges stem from Russia’s revisionist policy following the annexation of the Crimea and the destabilization of Eastern Ukraine in conjunction with the new Russian Doctrine and, of course, international terrorism. 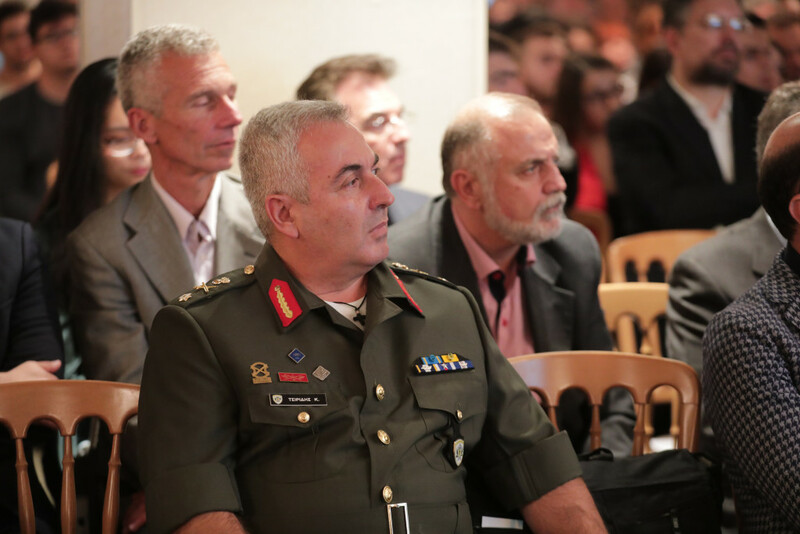 For these reasons, NATO is taking actions in empowering the provisions of Article 5 of the Treaty on collective defense, which haσ been weakened after the end of the Cold War. The Lieutenant General ret. 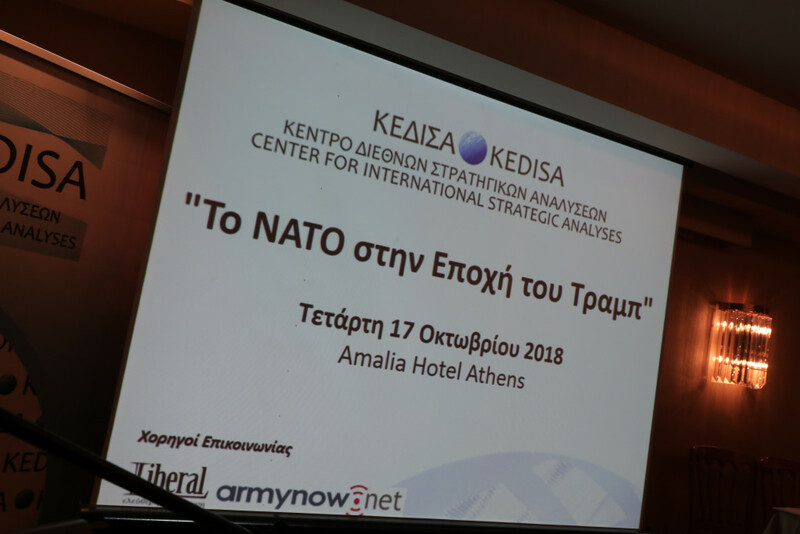 Mr. Lambros Tzoumis said during his speech that the election of Trump in the US Presidency would essentially not change NATO’s strategy and that was made clear by the Alliance’s decisions at the NATO Summit in Brussels on 11-12 July 2018. 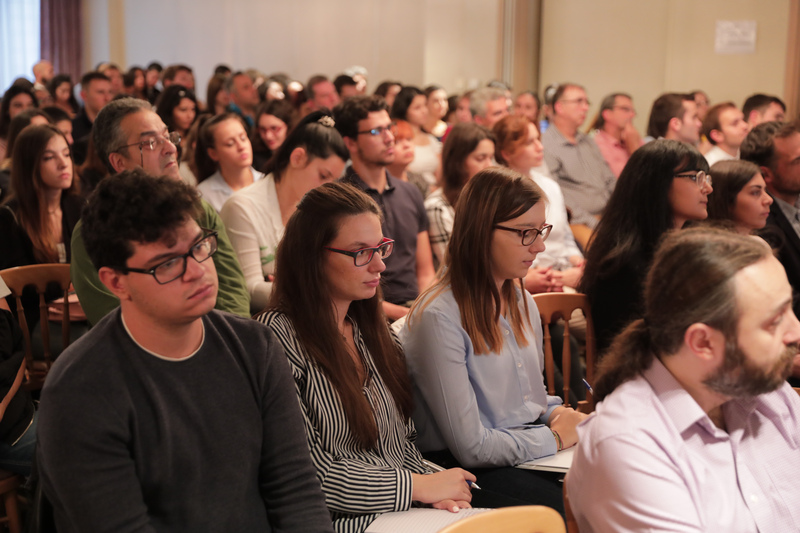 It also referred to NATO peacekeeping missions beyond its borders in areas such as Iraq and Afghanistan, the prospect of Western Balkan countries joining the Alliance, the increase in military spending of Alliance member states, NATO’s relations with NATO with Russia, China, the EU and Turkey, and NATO’s contribution to addressing the refugee-immigration crisis. He also referred to the failure of the promise made by US President George H. W. Bush to Soviet Soviet leader Michael Gorbachev in 1990 that NATO would not expand eastwards after the reunification of Germany while referring to the dark side of NATO, he mentioned the Turkish invasion and occupation of Northern Cyprus in 1974, the bombing of Yugoslavia in 1999 and the operation against Libya in 2011. Professor of Geopolitics at the Hellenic Army Military Academy, Dr. Konstantinos Grivas, in his speech said that today we have a “inflationary” NATO with too many member states and a dubious efficiency. 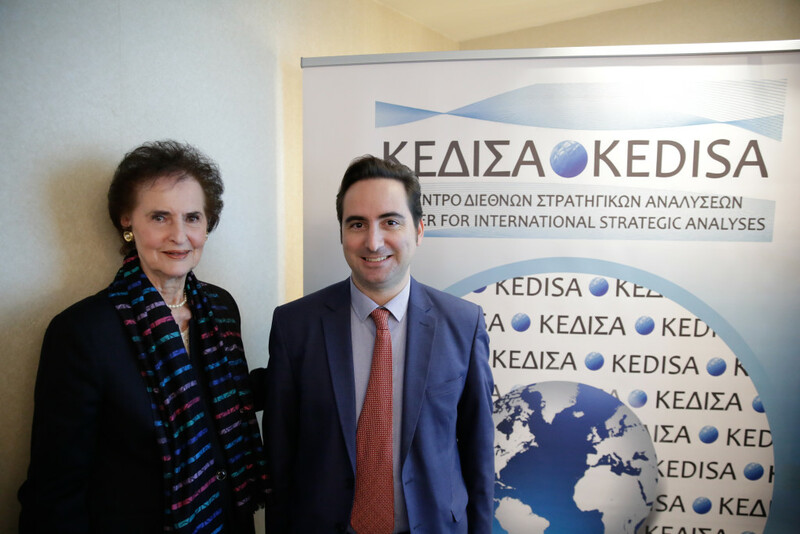 He then referred to the great progress made by Russia and China in the field of military technology and how it challenges the US’s hegemony in the international system. With regard to President Trumps’ policy, he noted that he is trying to implement (in spite of the opposition he faces from the foreign policy establishment in Washington DC) a modern, reversed version of the trilateral diplomacy of US State Department chief Henry Kissinger at the beginning of the decade of the 1970s. That is, Russia’s engagement in addressing China’s geostrategic threat to USA in the modern multipolar world. 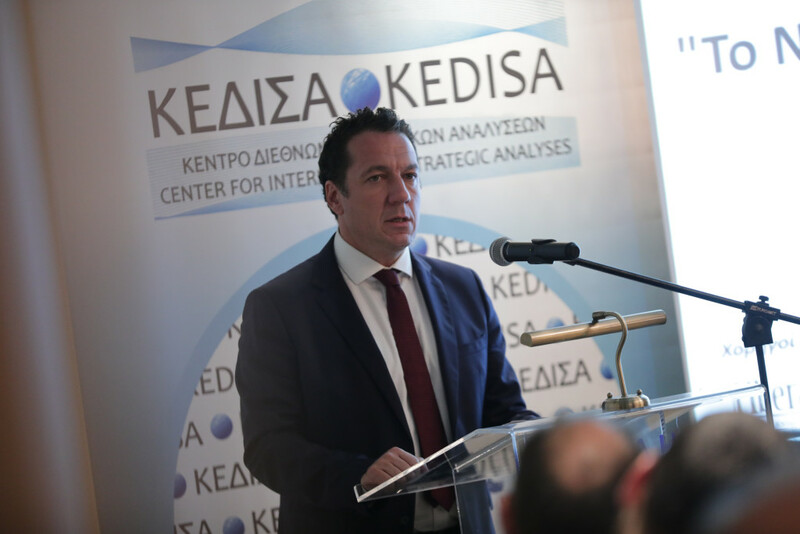 Finally, he noted that Greece in this international fluid geopolitical environment should exercise a foreign policy based on its national interests without being identified with any Great Power.